Steam reformers are commonly used for power and energy generation processes. 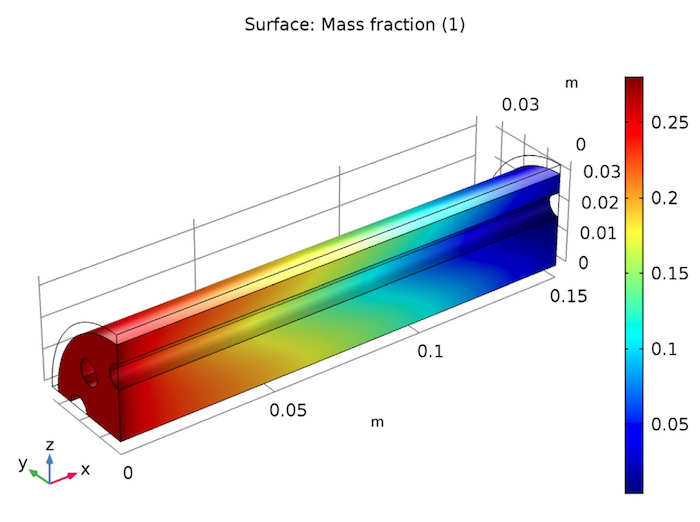 To accurately analyze the performance of a steam reformer design, you need to be able to couple mass, energy, and flow equations. 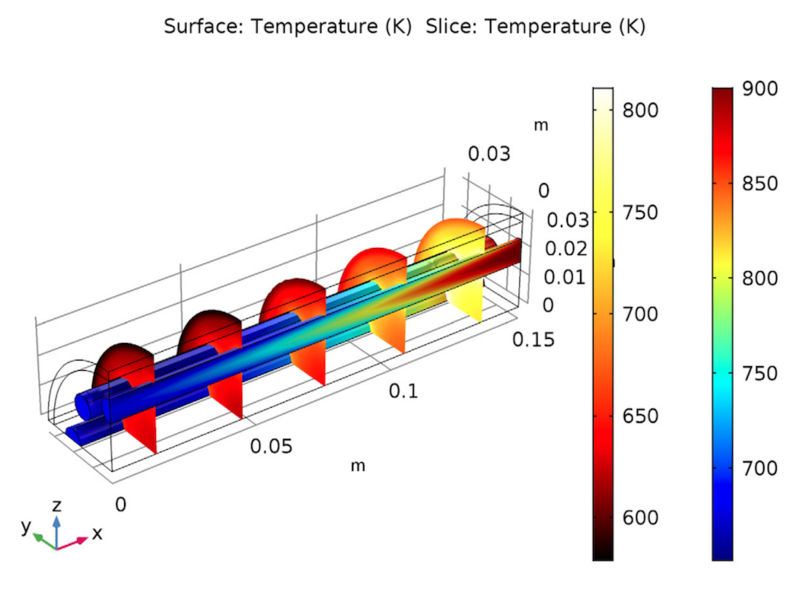 Using the COMSOL Multiphysics® software, you can set up a model of a steam reformer that represents its real-world behavior and operating conditions. Natural gas reforming produces around 95% of the hydrogen generated in the United States. Part of this production is thanks to steam reforming, an endothermic process that creates hydrogen by subjecting a reformer to high temperatures and reacting steam with a fuel like methane or propane. Steam reforming has a variety of applications. 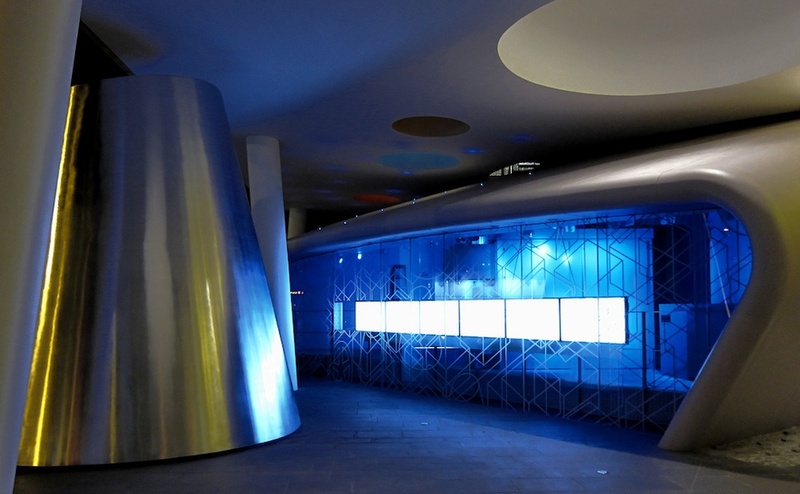 For instance, steam reformer units are often used in fuel cell power generators to provide hydrogen for fuel cell stacks, which are made up of many individual cells. An example of a hydrogen fuel cell power generator. Image by Lars Plougmann — Own work. Licensed under CC BY-SA 2.0, via Flickr Creative Commons. 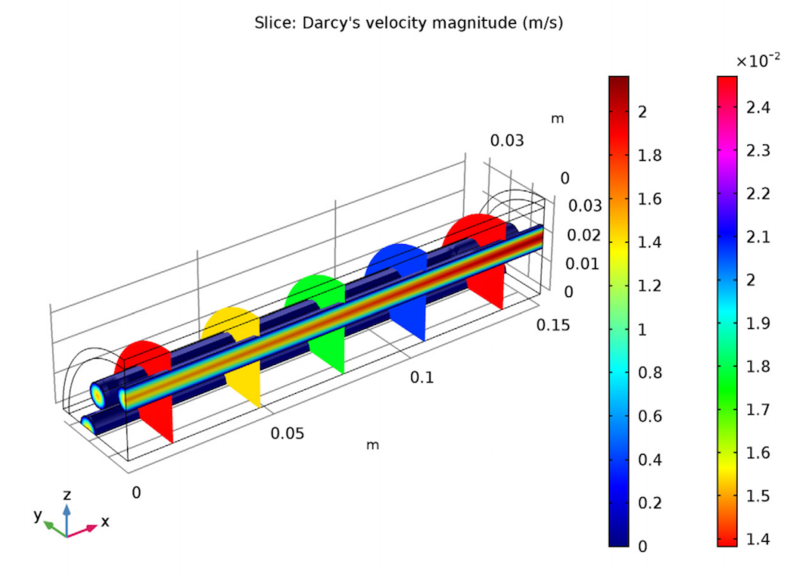 Let’s analyze a steam reformer design used to produce hydrogen for a stationary fuel cell unit. The steam reformer model geometry is made up of an insulating jacket, porous catalytic bed, and heating tubes. Of these parts, the heating tubes supply the energy needed for the system’s endothermic reaction, while the reformation chemistry occurs in the catalytic bed. At the beginning of the simulation, propane and steam enter through the inlet after being mixed in stoichiometric amounts. Meanwhile, hot gases from a burner enter through the heating tubes in the reactor bed and move in the opposite direction. When the water and propane react with one another in the reformer, they form carbon dioxide and the desired hydrogen. 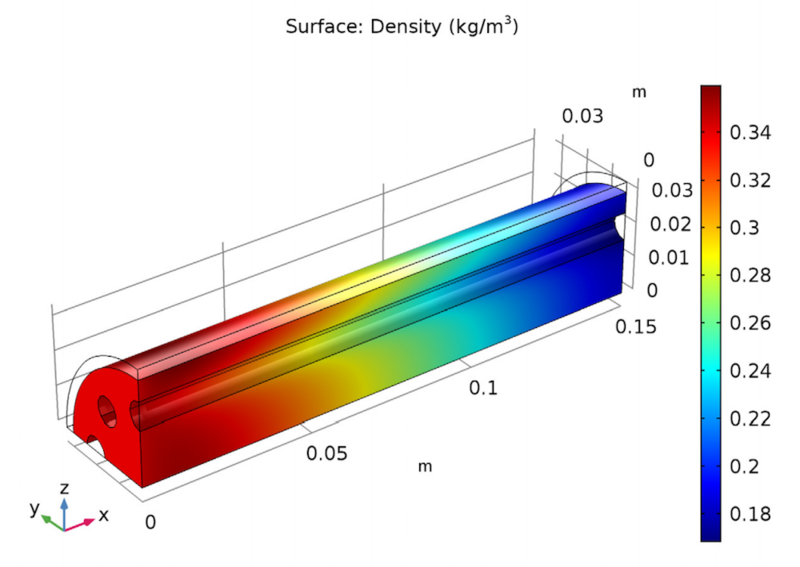 For details on how this tutorial solves for fluid flow, energy transport, and mass transport, take a look at the model documentation here. Model geometry of the full steam reformer (left) and the geometry when using symmetry to reduce the modeling domain (right). 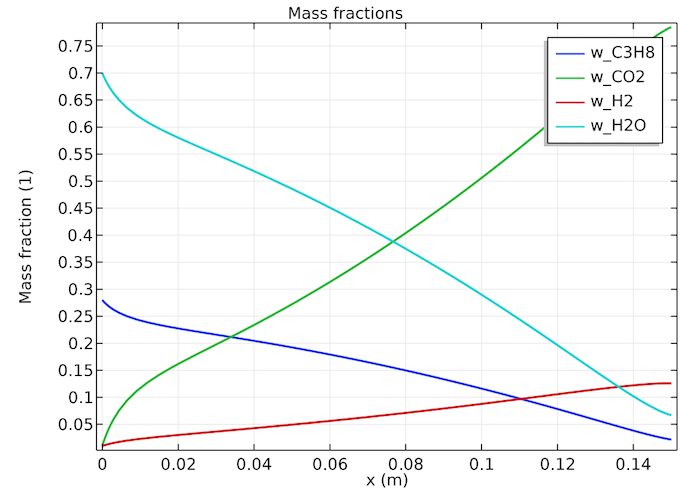 We can easily describe the mass, energy, and momentum equations in this analysis by using the predefined interfaces in the Chemical Reaction Engineering Module. First, we examine the weight fraction of the various species in the reactor bed. The image to the left below shows that the weight fraction of propane is 0.28 at the inlet and decreases to almost 0 at the outlet. By examining a cross section through the center of the reformer (middle image below), we can also visualize the concentration distribution of propane throughout the bed. Since temperature is the main determiner of local reactivity, we conclude that, in this example, the heat supplied by the tubes efficiently uses the entire catalytic bed. By looking at the weight fraction of every reacting species in the catalytic bed (right image below), we can confirm that the entire length of the bed is actively converting propane. 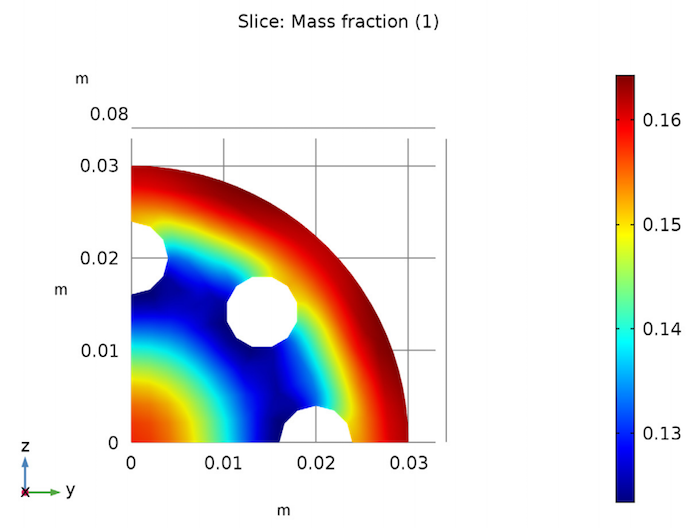 Mass fraction distribution of propane in the reformer bed (left) and in a cross section through the middle of the reformer bed (middle). The mass fractions of all of the reacting species are a function of the reactor position and are evaluated along the reactor centerline (right). Next, we take a closer look at the temperature in the reformer. When looking at the system as a whole, we see that the gas enters the heating tubes at 900 K and leaves the tubes at around 674 K. Meanwhile, the gas temperature within the reformer bed begins at 700 K and is reduced to a minimum temperature before rising again and exiting the bed at an average temperature of 795 K.
The plot to the right below visualizes how the endothermic reformation reactions cause the temperature to initially decrease. Then, when a lower temperature and amount of propane cause a reduced reaction rate, the energy supplied by the heating tubes determines the temperature evolution. As a result, the temperature increases again. 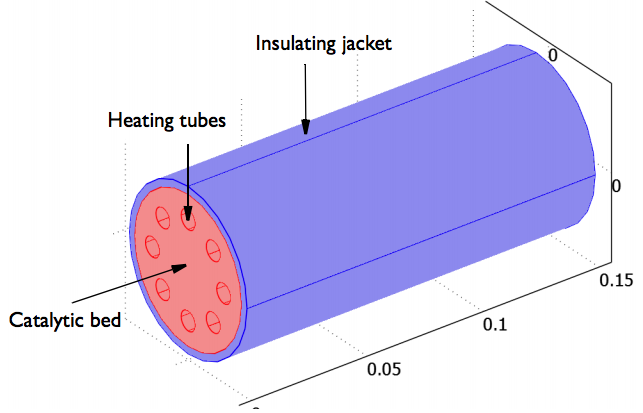 The temperature distribution and energy exchange between the bed, heating tubes, and insulating wall (left). The right image shows the temperature of the reformer bed as a function of position and evaluated along the centerline. Moving on to velocity, let’s analyze the heating and reacting gases. For the heating gas, the flow is laminar and we can clearly observe a parabolic velocity distribution. On the other hand, the reacting gas in the porous bed has a significant increase in velocity, so much so that its velocity at the outlet is around double what it was at the inlet. This increased velocity is caused by the gas expansion from the chemical reaction and the temperature increase. 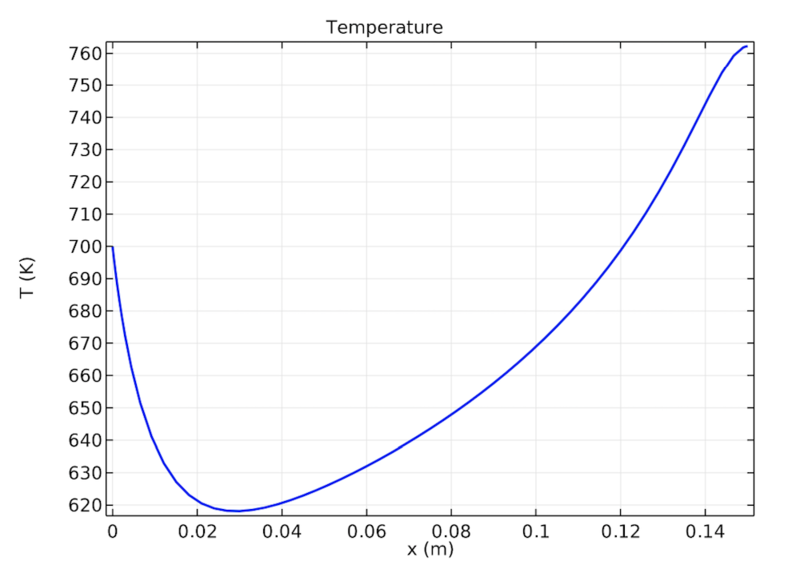 Velocity field plot, depicting the heating gas in the tubes and the reacting gas in the bed. The related density variation within the bed, which accounts for temperature and composition, shows that the density decreases through the reformer. Gas density in the reformer bed. 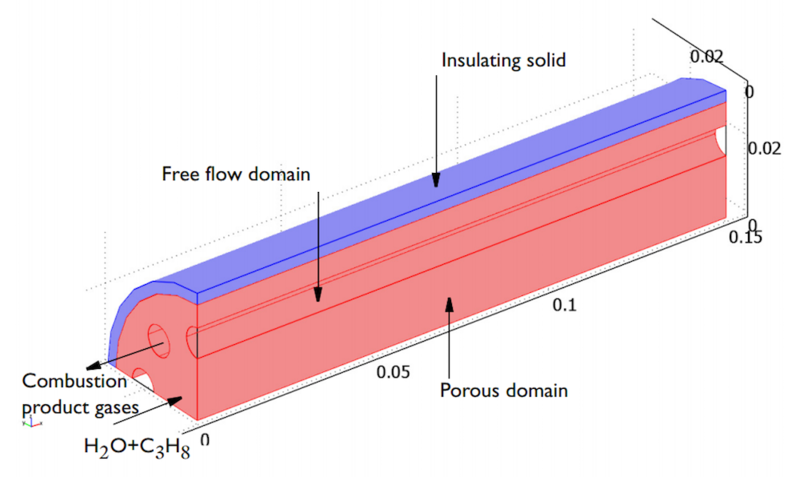 The goal of this tutorial is to demonstrate that by coupling mass, energy, and flow equations in COMSOL Multiphysics, you can successfully model a steam reformer. To try this example yourself, click on the button below.